Meet the latest spaced out modern artist - a picture-drawing robot arm in Australia whose brain sits in a petri dish in the US. Working from their university labs in two different corners of the world, American and Australian researchers have created what they call a new class of creative beings: "the semi-living artist". Gripping three coloured markers positioned above a white canvas, a robotic arm churns out drawings akin to that of a three-year-old. 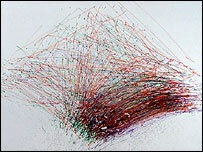 Its guidance comes from around 50,000 neurons of a deceased fellow rodent in a petri dish 19,000 kilometres away. The "brain" lives at Dr Steve Potter's lab at Georgia's Institute of Technology, Atlanta, while the "body" is located at Guy Ben-Ary's lab at the University of Western Australia, Perth. The two ends communicate with each other in real-time through the internet. The project represents the team's effort to create a semi-living entity that learns like the living brains in people and animals do, adapting and expressing itself through art. "We are looking at future scenarios where geography won't matter," said Mr Ben-Ary. "The brain of the semi-living could be anywhere in the world, while the body (machine) will interface and be fed off it," he told BBC News Online. "It really makes you think about the future possibilities, and realise that the sci-fi vision of movies like Cold Lazarus can turn into reality in the future." 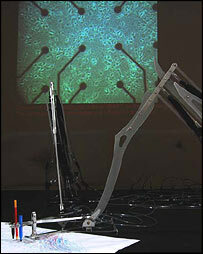 Termed Meart (Multi-Electrode Array Art), the cells are connected via 64 two-way electrodes to a computer and are stimulated by information; in this case transmitting scaled-down images of visitors in its vicinity, captured with a webcam. 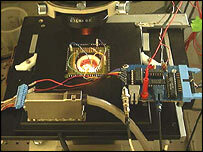 The computer translates any resulting neural activity into robotic arm movement. By closing the loop, the researchers hope that the deceased fellow rodents neuron culture will learn something about itself and its environment. "I would not classify [the cells] as 'an intelligence', though we hope to find ways to allow them to learn and become at least a little intelligent," said Dr Potter. Dr Potter hopes the venture will provide valuable insights into how learning occurs at a cellular level. The latest initiative is a development of the SymbioticA Fish And Chips project, in which the artist-scientists grew fish neurons over silicon chips to control a robotic arm that produced drawings and music.